Whether you believe the hype or not, lawtech is changing the legal market. Triggered by an influx of tech-savvy clients, law firms are increasingly turning to technology to develop innovative and efficient solutions to legal service delivery. 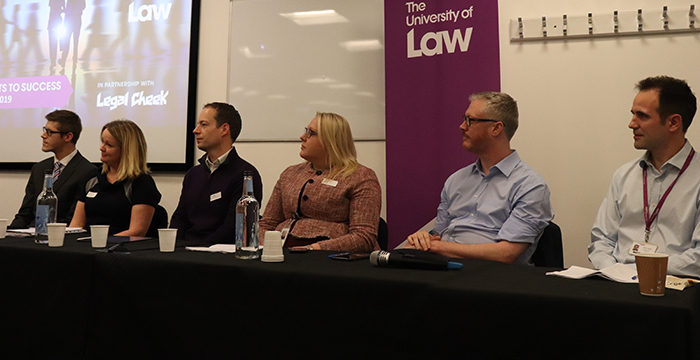 At last week’s Secrets to Success (lawtech special edition) event at The University of Law’s Moorgate campus in London, a panel of lawyers shared their insights — here are five things you need to know. 1. Is coding know-how a must? “No” is the short answer, according to Simon George, an associate professor at ULaw and head of ULTRA (University of Law Technology Research Academy). Learning to code takes a significant amount of time and isn’t something which you can learn on a four-week course, George told an audience of 90 students. Nonetheless, having a foundational understanding of coding will help you understand how lawtech can be used and what it’s capable of. As George suggested, being able to speak basic tech-talk will go a long way when working with software engineers to build tech-based solutions. 2. To build or to buy? Claire McKellar, a senior associate in Pinsent Masons’ banking and finance team, explained that law firms have two choices: build their own legal technology in-house or partner with a legal tech company and buy “off-the-shelf”. Building tech in-house is appropriate when projects involve a specific problem for which a solution can be quickly constructed, Bryan Cave Leighton Paisner’s (BCLP) director of innovation solutions Nick Pryor revealed. But in the absence of a commercial incentive to build in-house, firms will often look to buy from the rapidly expanding lawtech market, he added. This, however, can be a complex process. McKellar, previously a manager of Ashurst’s legal technologist group, noted that buying third party services often requires additional testing and integration work before it can be effectively introduced into a firm’s operations. A strong selling point for lawtech, particularly artificial intelligence (AI) software, is its ability to complete the time consuming, laborious tasks, allowing lawyers to concentrate on high quality and high value work. This is especially seen in disclosure exercises in litigation departments. Traditionally lawyers had to go through hundreds of thousands of documents pertaining to a case in search for, what Pryor described as, “the silver bullet”. Now with eDiscovery, a cloud-based form of predictive coding, lawyers can use algorithms to quickly identify documents relevant to your case — saving law firms huge amounts of time and money. Nicola Cain, a media and data disputes partner at RPC, recalled the firm’s involvement in the Pyrrho Investments case — the first English civil case to conduct disclosure using predictive coding. Acting for the claimants, RPC found the software to be more accurate than associates going over “millions and millions” of documents, Cain revealed. Data analysis presents a lucrative opportunity for law firms. As Pryor explained, using lawtech to establish “structure in very, very unstructured data sets” could have a profound effect on the way firms operate. For example, George noted that firms could help clients’ businesses become more profitable by analysing their contractual and financial data. However, following the recent General Data Protection Regulation (GDPR), the EU framework which overhauled how businesses process and handle data, law firms now err on the side of caution — or risk facing hefty fines. “It shouldn’t have changed what you do as a lawyer, but the risk has changed and so the consequence of that is that people are making sure they’re clear and transparent about how data will be used,” Cain said. Additionally, the data-rich environments in which law firms operate make them a target for cyber-attacks. Cain noted that law firms are becoming increasingly conscious of online security and are taking extensive measures to protect their clients’ data. Slowing down the lawtech revolution is the lack of trust in AI. As stressed by tech-savvy Gowling WLG trainee solicitor Daniel Down, from an accountability perspective, it’s difficult to determine exactly how self-learning AI arrives at a conclusion. For clients and law firms to completely trust AI output and in the light of recent regulatory developments such as GDPR where firms need to be open about how their client’s data is processed, Down believes that — going forward — greater transparency is needed, which may also serve to eliminate any bias affecting the decision-making process. Looking ahead, senior manager of PwC’s NewLaw LawTech practice area, David Chamberlin, anticipates various disruptive applications of AI and robotic process automation (RPA)/expert system technology to legal service delivery. One interesting example is the deployment RPA to enable self-service through chatbots (programs designed to simulate conversation with human users). Lawyers spend a lot of time responding to questions that take up valuable time but require little expertise to answer. Instead, Chamberlin suggested RPA technology can ease this burden by using a combination of expert system functionality and data analysis enabled by AI to build chatbots capable of answering basic answers to legal questions.